This article will show you where and how to download Popcorn Time for Mac to stream classic and newly released movies and TV shows for free. Meanwhile, this post will show you the best Popcorn Time Mac alternative to help bypass Popcorn Time not working errors, such as no sound when watching movies on Popcorn Time for Mac. But if you are fed up with Popcorn Time errors or want to watch movies and TV shows offline, you can free download movies or TV shows from YouTube to Mac, iPhone, iPad, Android or other devices. Free download full classic or new HD movies, TV shows, videos and songs/movie soundtracks from YouTube and more sites for playing on iPhone, iPad, Android, etc with the help of the best free Popcorn Time alternative - WinX HD Video Converter for Mac (Mac OS X 10.6 and above, incl. macOS Mojave). Where and How to Free Download Popcorn Time on Mac? Popcorn Time is now available to download for Mac, iOS, Android, Windows and Linux. If you want to free stream movies and TV shows on Mac via Popcorn Time, you should firstly download Popcorn Time app on your Mac. But before downloading, please make sure you are working on Mac OS X 10.7 and later. This is because Popcorn Time Mac version is only workable for Mac OS X 10.7 and above. Step 1. Go to http://www.popcorn-time.eu/, find out Popcorn Time Mac version and click on download button to get started. Step 2. Install Popcorn Time on your Mac computer, such as iMac, MacBook. And then you can use Popcorn Time to enjoy movies and TV shows on Mac for free, such as The Hunger Games: Mockingjay – Part 2, Star Wars 7: The Force Awakens, etc. You are allowed to choose which movie or TV show you like, choose video quality 720P or 1080P, and select subtitle language. After loading successfully, you will embark on a happy movie journey, if everything goes well. However, you may come across some Popcorn Time working errors. "I'm having some trouble with no audio from 720p TV shows everything else movies and the lower quality TV shows all work great I'm using PCT 3.40 on Mac with Yosemite 10.10 streaming to chrome cast other than that everything is great." "I have a strange problem on my MacBook with Popcorn. A part of the program is disappearing underneath my Mac menu. Now I can't search movies anymore. I really tried anything to get Popcorn in front of my Mac." "Hi , I was using popcorn time with OS X maverick but now that I put OS X Yosemite tells me that the navigator doesn't support the movie or video and that is damaged, so I downloaded chrome and deleted an installed it again but after three minutes of film it pauses and says it isn't working." We only list several problems among multiple Popcorn Time working errors. Some errors can be fixed by reinstalling Popcorn Time on Mac, downloading the latest Popcorn Time version, or changing some settings. But sometimes you have to turn to Popcorn Time alternative for help. If downloaded Popcorn Time Mac version doesn't work for you, no matter due to domain issues, version problems or OS incompatibility, this Popcorn Time Mac alternative with the name WinX HD Video Converter for Mac can help you out. WinX HD Video Converter for Mac is a free YouTube downloader capable of downloading movies and TV shows in MP4, FLV, WebM and 3GP format with SD, 720P HD, 1080P HD or 4K UHD video quality from YouTube with ease. And it is fully compatible with Mac OS X 10.6 Snow Leopard and higher, including macOS Mojave. It helps free downloading movies and TV shows for offline watching on iPhone X/8/7, iPad Air 2/iPad Pro and other handsets anytime anywhere. Download this Popcorn Time Mac alternative, install and launch it to get started. Step 1. Find your target movie/TV show video in YouTube and add the URL address. Step 2. "Paste & Analyze" the URL, and choose output video resolution. Step 3. Hit "Download Now" to begin downloading. Tips: If you want to make downloaded movies/TV shows fully compatible with your devices, you can check "Auto add to convert list" and use this Popcorn Time Mac alternative to convert to iPhone 6/6s (Plus)/SE/7/8/X, iPad Air 2, iPad mini 4/Pro, Apple TV (3/4), iTunes, Android, Samsung Galaxy S9, HTC One M8, Google New Nexus 7, Chromecast, Amazon Kindle Fire, Surface Pro 3, WP8, Xbox, PSP, etc. If you need to free download movies/TV shows/songs from YouTube, Dailymotion, Metacafe, Facebook, etc, as well as convert them to mainstream formats (MP4, AVI, WMV, MOV, MKV, MP3, iPhone Ringtone, etc.) or devices (Apple, Android, Sony, Microsoft, etc. 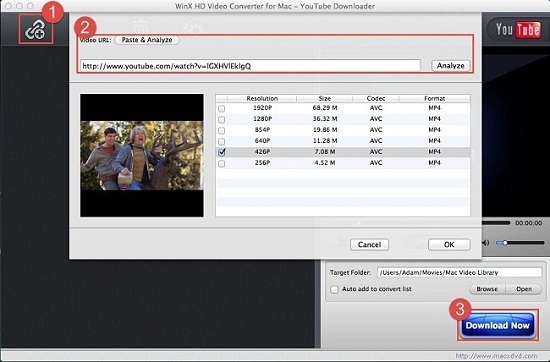 ), please turn to WinX HD Video Converter for Mac.